Find out why Value Investing by Martin Wthman is a great book. 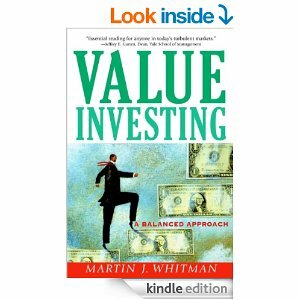 Value Investing , by Martin Whitman provides a “balanced approach” to investors. And by the way, even though you may not have heard of Martin Whitman, he’s an incredibly smart value investor, author and thinker. If you’re curious, here’s his recent letter to shareholders, on en Graham and HFT. So in this book review, we’ll take a close look at Value Investing, to see if Martin Whitman’s approach to markets makes sense. And to decide if this is the right value investing book for you. Now let’s get to it. Value Investing was published in 1999, so it’s a relatively contemporary look at value investing (compared to the likes of Security Analysis and The Intelligent Investor). And yet the level of thought is just as good. Whitman provides a modern look at value investing that’s concise, to the point and bound to improve your investment decision-making process. His discussion is actionable and focused on helping you make smarter decisions in the stock market. When I first started reading this book, I was expecting just another take on the old Graham and Dodd idea. But Whitman’s value investing book actively compares and contrasts his interpretation of value investing with Graham and Dodd fundamentalism, as well as short term trading and efficient market theorists. This well-rounded approach makes his arguments entirely more convincing. And powerful. Outside Passive Minority Investors (OPMI) Whitman’s book quickly introduces the term OPMI. And it refers to the average individual investor participating in the stock market. His whole book addresses things in terms of this audience, relative to the way insiders and financial institutions can play the game. It’s illuminating. Markets are Everywhere Whitman makes it clear that value investors don’t just think about the OPMI stock market price (e.g. what you can sell your stock for on an exchange right now). Instead, value investors look for opportunity in M&A markets, LBO markets and going private markets. Think outside the stock exchange. How Other Market Participants Think Along the same lines, Value Investing gives illustrative examples of how other participants, like Wall Street promoters and underwriters, as well as corporate insiders, are working the system. When you can see what you’re up against as an OPMI it help you make better moves and maintain your composure. And this is just the tip of the iceberg. Value Investing has even more valuable points that you’ll have to read for yourself. But while I really enjoyed reading Whitman’s Value Investing book, it’s probably not for everyone. Just allow me to explain. Value investing is also a big of a technical book. It’s not an entirely easy read. And if it was the first book I read on value investing I might have been overwhelmed. For beginners, I think it makes sense to read The Intelligent Investor first. Value Investing is a relatively short book and it cuts to the chase pretty quickly. You might find it a bit overwhelming if you aren’t familiar with basic investing terminology. Make sense? Value Investing, by Martin Whitman, is a great book for advanced and intermediate value investors. It introduces a number of incredibly important concepts that aren’t touched on anywhere else. For that reason, I recommend you buy Value Investing on Amazon . If you’re still looking for more information on this value investing book, I encourage you to check out the video book review below. This entry was posted in Stock Ideas and tagged value investing book review on August 7, 2014 by Jworthy.